Jeremy P. Tarcher/Penguin a Member of Penguin, 9780399165313, 268pp. 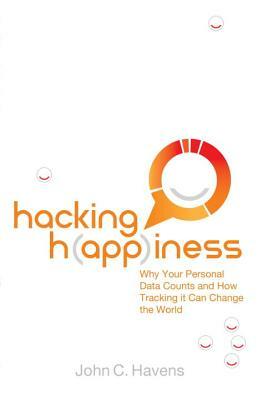 In "Hacking Happiness," futurist and contributing "Mashable "writer John C. Havens introduces you to your quantified self your digital identity represented by gigabytes of data produced from tracking your activities on your smartphone and computer. Harvested by megacorporations such as Google, Facebook, and Amazon, Havens argues that companies gather this data because of its immense economic value, encouraging a culture of sharing as they hoard the information based on our lives for private monetary gain. But there's an alternative to this digital dystopia.Emerging technologies will help us reclaim this valuable data for ourselves, so we can directly profit from the insights linked to our quantified selves.At the same time, sensors in smartphones and wearable devices will help us track our emotions to improve our well-being based on the science of positive psychology.Havens proposes that these trends will lead to new economic policies that redefine the meaning of wealth, allowing governments to create policy focused on purpose rather than productivity. John C. Havens is a contributing writer for Mashable, The Guardian, and The Huffington Post. He is the Founder of The H(app)athon Project, a non-profit organization, Connecting Happiness to Action one phone, one heart, and one city at a time through the use of interactive, sensor-based smartphone surveys.A former EVP for a top-ten global PR firm, he has counseled clients like Gillette, HP, and Merck on emerging and social media issues, and has been quoted on issues relating to technology, business, and well being by "USA Today," "Fast Company," "BBC News," "Mashable," "The Guardian," "The Huffington Post," "Forbes," "INC," "PR Week," and "Advertising Age." Havens was also a professional actor in New York City for over 15 years, appearing in principal roles on Broadway, television, and film." "The book certainly opens up an important conversation about how individuals can, and should, manage their data in an age of rapid advancements in personal technology. Mashable and Guardian contributing writer Havens provides a detailed defense of how developing technologies in augmented reality and wearable devices can increase happiness...An optimistic vision of how new technologies can be reimagined to increase productivity and personal growth." "Hacking H(app)iness is a mind boggling and optimistic vision of how new technologies can be reimagined to increase productivity and personal growth—and you don't have to be a geek to like it." "In Hacking H(app)iness, I was excited to find a discussion of psychology and technology that extends far beyond a self-improvement guide. Havens weaves together trends related to personal data with futurist scenarios and poignant details from his own life to illustrate how data can help us hold ourselves accountable to others. I recommend this to anyone trying to boost the wellbeing of individuals and communities."